That’s some of what Manaher has been up to since starting this particular role in 2013, making her one of our 2018 Women in Biometrics Award winners. Manaher is considered integral to the success of CBP’s biometric mission. CBP has biometric operations at 14 entry locations and 15 exit locations so far, and the agency is regarded as the catalyst of innovation in government. We’re so invested in facial recognition that we’re willing to say that we won’t even require a passport. Any time you have to show your identification, we believe that the face is the key to your travel efficiency. 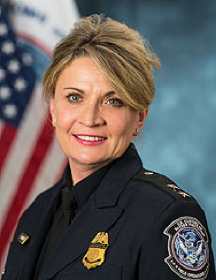 Manaher’s has held various positions in her nearly 30-year law enforcement career. Her biggest call to action came after the September 11, 2001 terrorist attacks — when government leaders saw the need for biometrics at U.S. ports of entry. She went back to school to achieve the status needed for deploying biometrics and handling big money programs. Manaher and four other winners will be honored with the Women in Biometrics Awards on November 14th in New York City. The Security Industry Association will join SecureIDNews to present the awards during one of the security industry’s most prestigious events, SIA Honors Night.